I’m happy to be joining Olin College next year, as a professor of design. Olin is an engineering school, all undergraduate, only 12 years old, with an enrollment of 350 students total. There are no departments! It’s a refreshingly unorthodox place. I can’t wait. I’ve been saying for some years now that my wish is to be as close to science-making as possible: that is, not merely teaching complementary art and design practices for young scientists in training, but to be in the formative stages of research and development much further upstream in the process. Asking collaboratively: What research questions are worthy questions? What populations and individuals hold stakes in these questions? Are there important queries that are forgotten? Could parallel questions be pursued in tandem—some quantitative, others qualitative? And how do we engage multiple publics in high-stakes research? 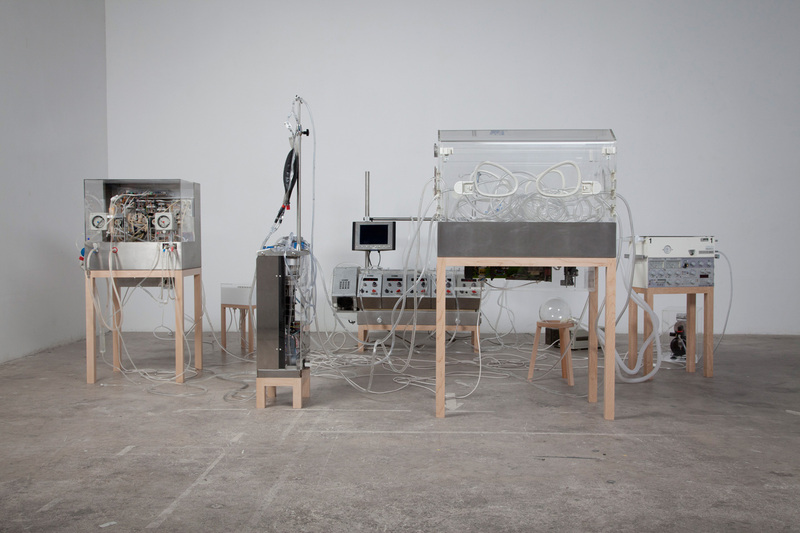 The Immortal, described by Cohen van Balen: Webs of tubes and electric cords are interwoven in closed circuits through a Heart-Lung Machine, Dialysis Machine, an Infant Incubator, a Mechanical Ventilator and an Intraoperative Cell Salvage Machine. The organ replacement machines operate in orchestrated loops, keeping each other alive through circulation of electrical impulses, oxygen and artificial blood. 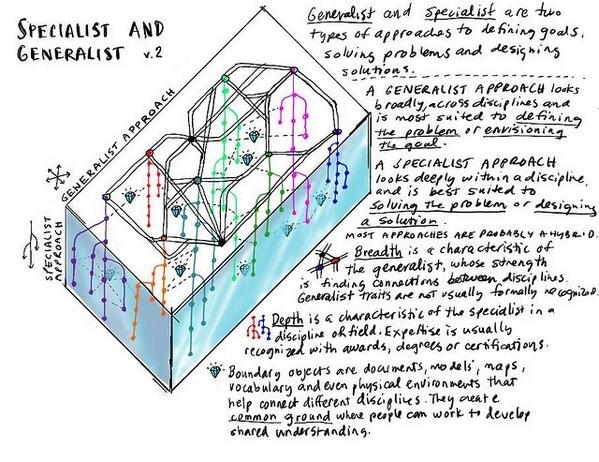 Gray has drawn a rectangular box, indicating the crossing paths of flows across the surface as the generalist’s domain, and the lines down into its depth as the specialist’s pursuit. Breadth, he says, is the characteristic of the generalist, and depth the characteristic of the specialist. A thriving academic research program surely needs both: but not just in the forms of symposia, scholarly ethics, or data visualization to (once more) “complement” or even complicate the science. It’s the last note of Gray’s that I’m particularly paying attention to, because it’s what good critical design and hybrid arts practices often do best: They act as boundary objects. Gray says those objects can be “documents, models, maps, vocabulary, or even physical environments” that mark these intersections of broad and deep ideas. Well, I’d say: especially physical environments and phenomena. At the scale of products or screens or architectural spaces, these objects can act as powerful mediators and conduits for ideas. They can become modes of discourse, opportunities for public debate, sites of disciplinary flows. It’s these kinds of objects that I’d like to be a feature of the studio/lab/workshop I’ll bring to Olin: An ongoing pursuit of ideas-in-things that live at all the various points along a continuum between practical use, on the one hand, and symbolic or expressive power on the other. Two poles in the manner still most accessibly captured by Anthony Dunne and Fiona Raby—both of which I’d like to be present. And what does this mean for the habits of mind we cultivate? I return often to the ideas of Jack Miles in this essay—also about generalists and specialists, with a key useful heuristic: that specialists tend to embody the disposition of farmers, while generalists tend to embody the virtues of hunters. Both are necessary, and both need each other. The careful tending to a field whose needs are more or less known, protected, and nurtured further, on the one hand. And the more landscape-crossing, round-the-next-bend pursuit of the not yet known and its promised nourishment, on the other. I want students to try out and value both operative modes, no matter where their own career paths take them. Knowing that others are also asking valuable questions in different disciplinary ways ideally breeds humility: a sense that what one has to offer could be enriched when conjoined in conversation with others whose expertise may not be immediately legible from within a silo. And not just humility: I want students in engineering to know that their practices can be both private and public, that their status as citizens can be catalyzed through making things. Things that may be practical, performative, or both. The Public Laboratory sells balloon mapping kits such as these, with a large balloon and adhesives for a camera, to equip citizens with supplies for crowd-sourced knowledge-making. In practical terms, we’ll be looking at labs like Tom Bieling’s Design Abilities group in Berlin, Ryerson’s EDGE Lab, the Age and Ability Lab at RCA, and the newly-formed Ability Lab at NYU Poly. But we’ll also be looking methodologically at Kate Hartman’s Social Body Lab at OCAD, at the CREATE group at Carnegie Mellon, and of course Natalie Jeremijenko’s Environmental Health Clinic. Possible paths to pursue: A “design for one” stream of prosthetic devices made for one user’s self-identified wish or need. An ongoing partnership with any of a number of schools or clinics in the Boston area where provisional and low-tech assistive devices could make education more responsive to children’s up-to-the-minute developmental needs. Short-term residencies and workshops with critical engineers and artists working with technology and public life. Public, investigative performances and installations that address issues of ability, dependence, and the body in the built environment. These things will take time! I can’t wait to begin. Thanks to Justin Pickard and AKAMediaSystem.